Cork City fell to their fifth defeat in ten league games as UCD struck for two late goals at the Bowl in Belfield. With five minutes left, City led thanks to Seán McLoughlin’s first-half goal but were down to ten men after Garry Comerford’s red card. The hosts were level when Yoyo Mahdy’s shot slipped through Mark McNulty’s hands and in the 92nd minute Gary O’Neill completed the turnaround with a goal from a penalty. Following on from Friday’s last-minute concession of an equaliser to St Patrick’s Athletic, the result means City have 11 points from ten games. Dundalk have halted a run of back-to-back defeats in the SSE Airtricity Premier Division. A Pat Hoban penalty deep into injury time secured a 1-nil win for the Lilywhites over Bohemians at Oriel Park. 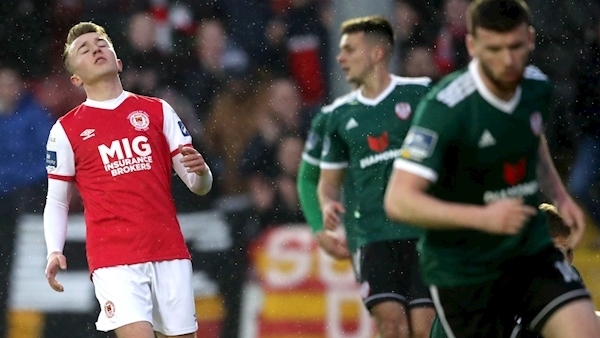 Derry City are up to second following a 3-1 victory away to ten-man St Pat’s. An injury time penalty from Gary O’Neill saw UCD complete a comeback to beat ten-man Cork City 2-1. While Sligo and Waterford played out a nil-nil draw at the Showgrounds.